This third part — the last of the think-y pieces, I promise! — is about the process of reviewing and continuous improvement. The subsequent parts of this series are small ideas and inspirations about the literal things to take with you traveling. Hey, great trip. Welcome home. Drop your bag. Sleep if you need to. But now it’s time to review! Here you’re reviewing the things you did not have with you. You’re trolling your recent experience in search of things to add to your packing. Either things to always carry, or maybe just things to have on hand, ready to pack, to give you more options on future trips. Buy some thing, (or add it to your general list of things to do, “buy this thing when I have spare cash”,) find a solution for some problem, (or add “find solution to the problem” to your to-do list,) etc. Then get rid of the notes! Aside: Those notes are the result of what is called “capture.” You had an idea, you captured it, but that’s not a solution. You have to convert that “captured” item into something; buy it, fix it, or turn it into however you keep track of things to do. Beginner level: Did I use it? As you handle everything you’re unpacking, ask: Did I use it? NO? Why did I pack it? Should I pack it next time? Some things always get a pass. 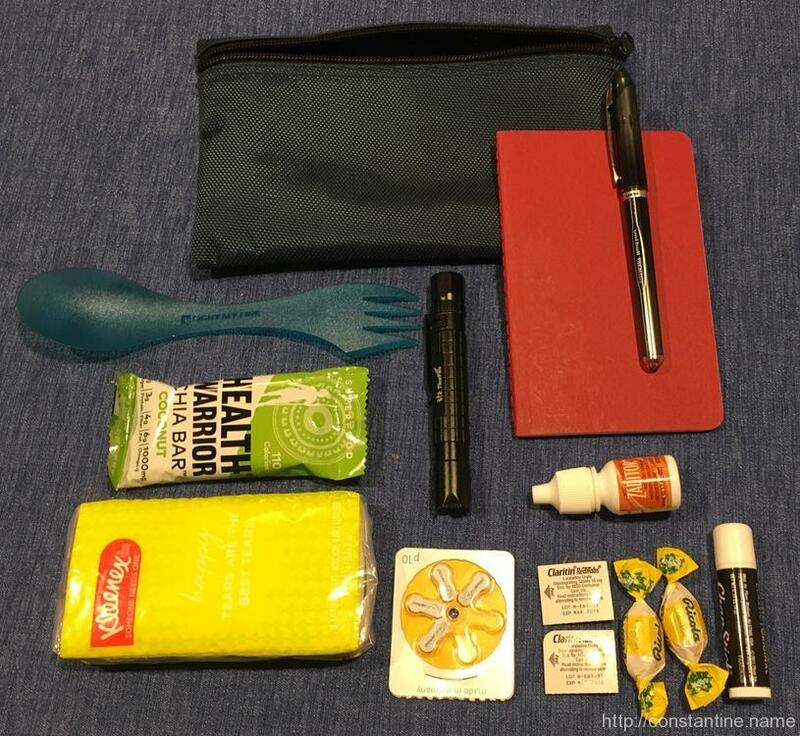 For example, my medical/urgency kit usually does not get used, but I’m always going to carry it. Ditto for a few things like my travel flashlight. I put all of these “they get a pass even though I did not use them” items away first. Anything left? Great! These are your first batch of things to review. Ask yourself: Why did I pack this in the first place? What was I thinking? What was I preparing for? In the future, would I be ok without this? Aside: I once went over-night hiking along the Appalachian trail. Although we were planning to stay in a shelter, we brought a tent in case the shelter was full. I carried a hammer in case we had to drive tent stakes. I brought a hammer on a hike along a mountain full of rocks on the chance we might need to drive tent stakes. By the end of that hike, I had learned a very important lesson about carrying things which I only _might_ use. Intermediate: Start keeping track of what you pack. Along the way, I started keeping lists– eventually very detailed lists– of everything I packed. I started by writing a list of what I was thinking of packing. Then as I packed, and added or decided against packing items, I kept the list up to date. When I returned, I would sometimes add notes about things I didn’t use, along with my decisions about whether I should pack that next time. For me this was particularly helpful for some of the less-used things I kept forgetting. At the “Beginner” level, we gave a pass to anything we used. But at this level, we want to start thinking about anti-packing things even though we’ve used them. Advanced: Actively removing items and weight. One of the heaviest things in my bag turned out to be my iPad with its attached keyboard-cover in a Pelican case. I realized that for $20 I could buy a smaller version of the same keyboard cover, which not only weighed less, but also fit into the next size smaller Pelican case. This ended up being a huge weight and volume savings. I travel with an external battery and charge devices from the battery. I charge the battery when power is available. I realized that I never drained the battery completely, and sometimes I’d go entire trips without recharging the battery. Since I was already carrying the charging cable and power brick, I bought a smaller battery which weighs half as much. Soon I had “minimized” all the big items, and reached a point where I could fit everything I needed into my bag. At this point I was traveling comfortably. As my trips became more complicated and involved more movement, (walking longer distances, more complex transportation combinations, etc..) it became obvious that weight was the limiting factor. I eventually went so far as to weigh everything. I literally weighed every individual item, to the gram, and put them in an outline with sub-totals. I can literally pack using the outline and predict what the final pack will weigh. This part concludes the large introduction pieces of this series. The following parts are actually the parts of the series which I first began writing. As I collected and organized them, I realized I needed to capture all the information in these first posts. I hope you’ve found these introductory parts useful, and I hope you find more useful ideas in the following posts! Put it where you got it! It’ll be there when you go for it! In certain productivity and self-improvement circles there is an idea called Clearing to Neutral. Simply put, when ceasing work on something think ahead to the next time a task will be worked on, and eliminate as much start-up friction as possible. Having all your travel and packing items in their place means packing for a trip is simply taking things out and putting them into your bag. (And perhaps some things should simply be kept in your bag.) That’s as close to zero-friction as possible. So clearing to neutral suggests I prepare for the next trip by immediately putting everything away. These tubs are perfect; you can see what is in them and they are easy to handle. I have one which holds things I grab most frequently; for example, my micro-flashlight and M’Urgency kit. I have another tub which holds the less-used random stuff; for example, the replacement o-rings for my flashlight, those little toothpaste tubes the dentist gives me, refills for my cartridge razor, and my rarely used, travel laundry kit. When packing, I just pull the tubs out and grab what I need. The tubs can be stored on a high shelf, on the floor in the back of a closet, or in the garage. Regardless how exactly you store your travel gear, it should have a dedicated home where things don’t get dirty, lost, or eaten by your cat. So now everything has its place, and I’m mentally prepared to spend time putting things away when I return. But I have a problem: When I return, some — often most — of my stuff is not ready to be stored. I gave out a bandaid from my M’Urgency kit which needs to be replaced. The sheet from my sleep system needs to be washed. I lost a zipper-pull on my backpack that needs to be replaced. My flashlight needs a new battery. My razor needs a new cartridge. I need a new bar of soap. …and on and on. Each of these issues is a very small thing to take care of, and it is tempting to leave these small tasks for later. But this is exactly the moment where a little work now leads to zero-friction later. This is where the magic of clearing to neutral shines. All of those little issues would slow me down — or worse, leave me in the lurch during a trip — when next I pack to travel. By taking care of them when I return, I eliminate all the friction and make packing a breeze when the next opportunity arises. If I’m exhausted, I may simply set my bag down and go to sleep. But when I’m ready to unpack I explode everything in one place. I pull everything out and if it’s ready to store, (that is to say, it is ready to use again when I next travel,) I put it away immediately. If it needs something, I leave it in the exploded area. Normally, this is right in the middle of the floor, in the middle of a room. So the goal is to clean up the entire pile. Laundry into the laundry basket, or better yet, right into the washing machine. Get a fresh battery, change it and put the flashlight away. Grab a spare zipper pull and fix the backpack. Grab a bandaid and razor cartridges from the spares tub and fill up the M’Urgency and bathroom kits; then put them away. Zip, zap, done. Aside: I clear everything to neutral. Years ago, my Hueco backpack came with spare zipper-pulls. I put them in a ziplock bag, with a 3×5 card that says “spare zipper pulls for Hueco” in the tub of less-used items. By the time I lost a zipper-pull, I had completely forgotten it had come with spares. But I knew that _if_ I had spare zipper-pulls, they’d be in the less-used tub. And there they were! Using processes like this will expand outward into the rest of your life. I just used the last of the spare razor catridges from the storage tub to refill my bathroom kit? Add “razor cartridges” to the shopping list that we keep in its assigned place, so everything is on the list when someone goes to the market. Go to the market, buy what is on the list. As you’re unpacking, sorting, cleaning, repairing, etc all your stuff, you’ll find you’re automatically reviewing; Which is the next part of this series.